It takes an average of 3 liters (0.8 gallon) of water to make one liter (about 1 quart) of gasoline. Unconventional oil such as that from Canada’s tar sands needs up to 55 liters (14.5 gallons) of water to produce that single liter of gasoline. If your gas contains 10% ethanol, filling up your car’s 60-liter (16-gallon) gas tank requires the consumption of a whopping 10,860 liters (2,869 gallons). That’s enough water to fill an above-ground swimming pool 3.7 meters (12 feet) in diameter. It takes 1,780 liters (470 gallons) of water to grow and process the corn to produce one litre of ethanol. 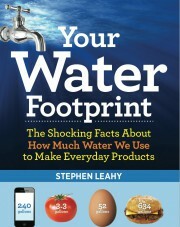 Stephen Leahy won the prestigious Lane Anderson Award for best Canadian science writing in the adult category for his 2014 book, Your Water Footprint. Based in Uxbridge, Ontario, Leahy reveals the astonishing amount of fresh water used to manufacture the products in our daily lives, from the clothes we wear, the food we eat and the music we listen to. The prize for best science writing in the children’s category went to L.E. Carmichael from Halifax, Nova Scotia. Carmichael’s book, Fuzzy Forensics: DNA Fingerprinting Gets Wild, investigates “crimes against wildlife” borrowing techniques from forensic science, like DNA sampling. Both Lane Anderson Awards are given by the Fitzhenry Family Foundation and come with a $10,000 cash prize.